Kimbert Solomon has over fourteen years post qualification experience in fiduciary services. 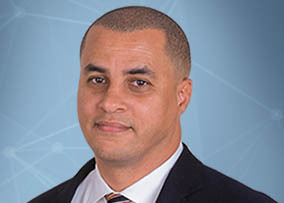 Having obtained his LL.B from the University of Liverpool, Kimbert has worked in various trust companies as well as having served as a Deputy Chairman of the Cayman Islands National Pensions Board, and Chairman of the Labour Tribunal. Kimbert previously worked at Citco Trustees in the Cayman Islands where he was In-house counsel and Head of private client trusts and corporate, responsible for the setup, administration and termination of complex trust and corporate structures across multiple jurisdictions, including the British Virgin Islands, Bahamas and Cayman Islands. As well as this experience, Kimbert is a Notary Public of the Cayman Islands, and an approved director by the Cayman Islands Monetary Authority, Central Bank of Curaçao, Securities Commission of the Bahamas and the Financial Services Commission of Barbados. Kimbert authored the “Employee Guide – Labour Law of the Cayman Islands”, and is fluent in Spanish.